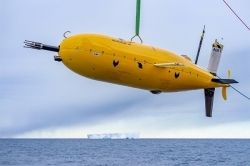 The National Oceanography Centre’s (NOC) autonomous underwater vehicle (AUV) Autosub Long Range (ALR), also known as ‘Boaty McBoatface’, has been successfully recovered following its first under-ice mission beneath the Filchner Ice Shelf in West Antarctica. The AUV was deployed in the southern Weddell Sea by German icebreaker RV Polarstern. The deployment forms a critical part of the Filchner Ice Shelf System (FISS) project, which aims to investigate and describe the current state of the complex atmosphere-ice-ocean system. 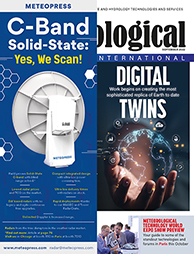 The collaboration involves leading UK research institutions including the NOC, British Antarctic Survey (BAS), Met Office Hadley Centre, University College London, University of Exeter and Oxford University, as well as international partners including the Alfred Wegener Institute (AWI), and the University of Bergen (UiB). ‘Boaty’ spent a total of 51 hours under the Antarctic ice and travelled 108km (67 miles) over a two-month period. The vehicle reached water depths of 944m (3,000ft), and spent 20 hours exploring beneath a section of the ice shelf that was 550m (1,800ft) thick. The AUV carried two sets of CTD (conductivity, temperature and depth) sensors to measure the salinity and temperature of the water. It was also equipped with a micro-structure probe to measure ocean turbulence, a sensor to measure the amount of phytoplankton in the water (by measuring the fluorescence of their chlorophyll), and a sensor to detect the turbidity of the water. Acoustic instruments (ADCPs) also measured the water current up to 80m (262ft) above and below the AUV’s position, and accurately measured the depth of the seabed and the draft of the ice along the vehicle’s track. Steve McPhail, head of AUV development, NOC, said, “I am delighted in the success of this mission. For the engineers involved, this was a very challenging deployment that was not without risk. We knew that the environment was harsh, with -20°C air temperatures and sea temperatures very close to the freezing point of seawater.